Men's Wearhouse Brown Leather Belt [menswearhouse.com] with Brushed Metal Buckle for $8 (YMMV). If you add the item to cart the price goes up to $19.99. You can chat with customer service or call the customer service and they will fix the price (to $7.99) for you in your cart. 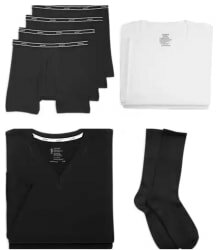 Men's Wearhouse takes an extra 50% off clearance men's sweaters. Plus, it takes 60% off a selection of men's designer suits. (Prices are as marked.) You can also find select suits are buy one and get another for free. Even better, free shipping applies. Brands include Egara, Pronto, Joe, and more. Deal ends March 24. Men's Wearhouse takes 60% off a selection of men's designer suits as part of its latest sale. Plus, a selection of men's designer sport coats are priced from $149.99. In addition, get three select dress shirts for $99.99. Even better, free shipping applies. Brands include Calvin Klein, Kenneth Cole, Lauren Ralph Lauren, and Tommy Hilfiger. Some exclusions apply. Deal ends March 17. Men's Wearhouse takes 60% off a selection of men's designer suits as part of its latest sale. Plus, a selection of men's designer sport coats are priced from $149.99. In addition, get three select dress shirts for $99.99. Even better, free shipping applies. Brands include Calvin Klein, Kenneth Cole, Lauren Ralph Lauren, and Tommy Hilfiger. Some exclusions apply. Ending today at Men's Wearhouse, buy one select men's suit on sale for $150 and get a second for free. Also, buy one select men's sportcoat on sale for $100 and get a second one free. Plus, Perfect Fit Rewards members bag free shipping. (Not a member? It's free to join.) Some exclusions may apply. 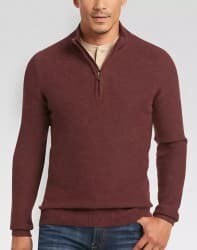 Men's Wearhouse takes 30% off a selection of men's sweaters, with prices as marked. Plus, Perfect Fit Rewards members bag free shipping. (Not a member? It's free to join.) Deal ends March 10. Men's Wearhouse has Up to 75% Off Select Styles. Shipping is free for Members, Free to Join. Men's Wearhouse has Up to 70% Off Select Styles. Shipping is free for Members, Free to Join. 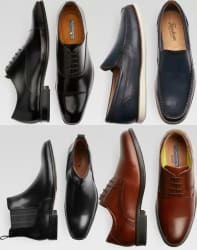 Ending today, Men's Wearhouse takes 30% off select Florsheim Men's Shoes. (Prices are as marked.) Perfect Fit Rewards Members also receive free shipping on all orders. Some exclusions may apply. Men's Wearhouse offers select men's designer suits from $199.99, and three select men's dress shirts for $99.99. Plus, many items qualify for a buy one, get one free promotion. Even better, all these orders get free shipping. Deal ends February 18. 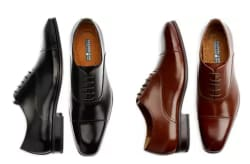 As one of its daily deals, Men's Wearhouse takes 30% off a selection of men's shoes. (Prices are as marked.) Plus, Perfect Fit Reward members bag free shipping. (Not a member? It's free to join.) Some sizes and stock are limited. Deal ends today. Men's Wearhouse has select sweaters on sale. Shipping is free for Reward members [free to join].